Last Friday, Josie had her first visit with the pediatrician. Her first couple of check-ups were done by our midwives, first at our house and then at the birth center, so we didn’t need to the see the pediatrician until it was time for vaccinations. While at the appointment, the doctor heard a heart murmur. At first she said that it sounded innocent, but as she listened she decided to order an echocardiogram because Josie has also been having difficulty feeding and gaining weight. On Tuesday, Josh and I took her for her echo and Josie was so well-behaved for it, but after the test the tech told me, “If you don’t hear from your pediatrician in the next couple of hours, go ahead and call her.” I’ve been through a billion tests with K and NEVER been told that, so when we got in the car I told Josh I didn’t think the results were going to be good. We headed back towards home and stopped at Sonic to grab lunch and as soon as we pulled in, the pediatrician called and said we needed to go to the ER immediately and would most likely be admitted to cardiology. Josie has a large VSD (hole in her heart) with significant shunting (blood going the wrong direction, making her heart work way too hard). So we went by the house to grab a few things and headed to the hospital. Once here, we were taken back pretty quickly and she had an EKG and chest x-ray done, and had labs drawn and IV placement was attempted. Cardiology came down and explained her heart defect, and that her heart is also enlarged and there was fluid on her lungs from the excessive work her heart had been doing (congestive heart failure). They went over the symptoms of her VSD: constantly feeding, falling asleep quickly when eating but not staying asleep very long before resuming feeding, sweating while feeding, fast breathing, difficulty growing and gaining appropriate weight. She had all of them, which we knew from Googling them after hearing about her murmur, so it wasn’t a complete surprise, but the symptoms also have totally innocent explanations, too. People say that newborns nurse a lot and not to pay attention to the interval between feeds. Babies get sleepy when eating. Sometimes babies get sweaty when nursing from the shared body heat. Babies breathe quicker than big people. She has had some latching difficulties from birth, so we thought the weight gain issues were due to poor milk transfer. But nope. She’s had a large hole in her heart all along, making it impossible for her to feed well enough to get full, thus the constant feeding. And the sweating. And the drowsiness. And the lack of actual naps. And the lack of weight gain. And the signs of inefficient milk transfer. It was like she was always running a marathon and trying to eat on top of that. So we are in the hospital now, trying to get her to gain weight. If she can start gaining weight, they are going to let us go home and let her continue to grow and get stronger for a couple of months before going in to close the hole surgically. If she can’t start gaining, they’ll have to repair it sooner. Right now she needs a feeding tube to get in her feeds (they let her eat for 15 minutes and whatever she hasn’t finished at that point goes in her NG tube), but they hope she will gain strength and be able to take them orally before we go home. They’ve given her meds to draw the fluid build-up out of her lungs and they are much better, but she is still struggling a lot with feeding. She isn’t supposed to nurse anymore for now because it takes more work than a bottle feed and they can’t track her calories and intake, so I’m pumping and they are fortifying my milk to make it more calories per ounce. We are SO thankful we found a bottle she can take recently, I can’t imagine trying to do all that trial and error while we are inpatient! She also likes her binky a lot more now, probably because she misses nursing, so we are thankful she’s accepting that substitute. I know people are curious about why this wasn’t discovered earlier. In part, it may be due to the delayed initial pediatrician visit, but larger holes are quieter and more difficult to detect…and often these are missed even at pediatrician visits until 6 or 8 weeks of life. If she had been born in the hospital, maybe they would have caught it, but maybe not. 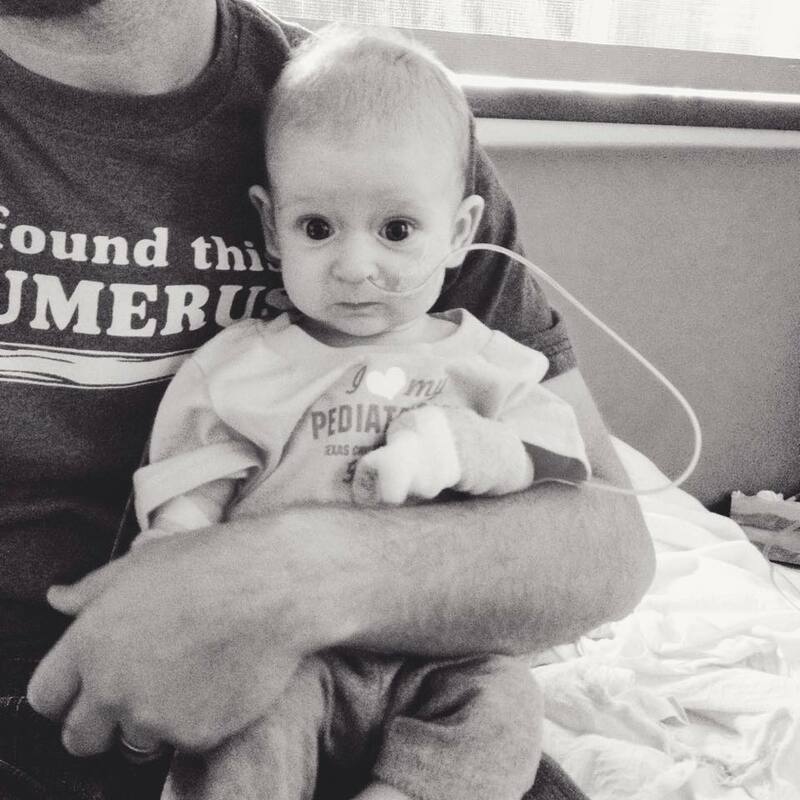 She passed her screening test for congenital heart defects at birth because this type of hole does not effect oxygenation levels. I don’t know that it would have been caught had we done things differently, but we are still SO thankful for her gentle entrance into the world and the months we got to spend at home before diving into all of this and wouldn’t change any of it. The symptoms she’s had since birth could also have been attributed to other things, so the detection of the murmur and the echo were the keys to catching it and thankfully it was caught. Hopefully she will start showing some gains and we will get to go home again in a few days! People have also asked about the big kids. They are handling it well. N has been a big help and now he’s spending a week or so with his best friend, and K is with my mom and had VBS and a couple other things to distract her this week. It will be very nice when we are all home together again! We just need our little Jo to grow so that can happen. Thoughts and prayers with you all. Hope she gets stronger and is able to eat PO and come home soon!! Hi, I know that y’all are busy. I just wanted you to know that I love y’all and am praying for you. I know that it takes a certain kind of strength in situations that concern our children and you two are exhibiting Thai strength and courage. May God continue to bless you and your beautiful family.